These PRPC 6.3 enhancements support the Direct Capture of Objectives features, and supports application developers as they work within the Designer Studio. The Branch RuleSet facility was introduced in PRPC 6.2 SP2 to facilitate parallel development of applications by multiple teams. In 6.3 you can, in a single operation, check out a rule that's in a locked RuleSet version directly into a branch RuleSet. In PRPC 6.2 SP2, this required two operations. The system also creates the branch RuleSet for you, if none is specified. The wizard is improved so that, when merging a branch RuleSet version into a RuleSet, you can call two flows of your choice as extensions to the standard flow. PRPC 6.3 makes it easier for your development teams to develop applications that are guardrail-compliant to a great degree, thereby reducing project risks, maintainability risks, performance risks, security risks, and cost. Three landing pages provide quick access to information on the sources, types, and severity of guardrail warnings. For examples, see Guided development through guardrails. Additional warnings are introduced, to help your developer team become aware of best practices and practices to avoid. The What's Happening display (the RSS newsfeed) and the Recent Actions landing page tab are enhanced to include information about warnings. Warning severity levels now appear as English words (Severe, Moderate, and Caution) rather than as numeric values. For a complete listing of warnings, see Dictionary of Rule Warnings. The Project Management Framework (PMF) allows PRPC application developers to define, manage and track progress of development projects. PRPC 6.3 provides tighter integration between development systems and a separate PMF installation, allowing easier initial configuration and fewer steps for updating. During check in, developers can view and directly access their PMF worklists. Application Express is enhanced to provide a quick, easy-to-use prototyping tool with many of the capabilities of the full Application Accelerator. From any of the Specifications landing page tabs, you can produce an Application Profiler document, in the format of the full application document, for a single specification, reflecting the current state of development. While working with the Profile Explorer, you can initiate an email exchange with others — who may not be operators who use the development system you are working in — to have them participate in the evolution of the application. Within a data transform rule, you can sort the pages in a Page List based on the values of one or more embedded Single Value properties on each embedded page. This enhancement eliminates the need to create an activity to perform such sorting. Object Lookup — The page contains a clipboard page of a single instance. Connector — The page contains the results returned from running a connector that queries an external system or database. Use a data transform to initialize property values for the connector request. Data Transform — The page contains property values set in a data transform. Also, you can use a new type of Declare Page rule (Load Only), to initialize a clipboard page that does not have the read-only restriction. 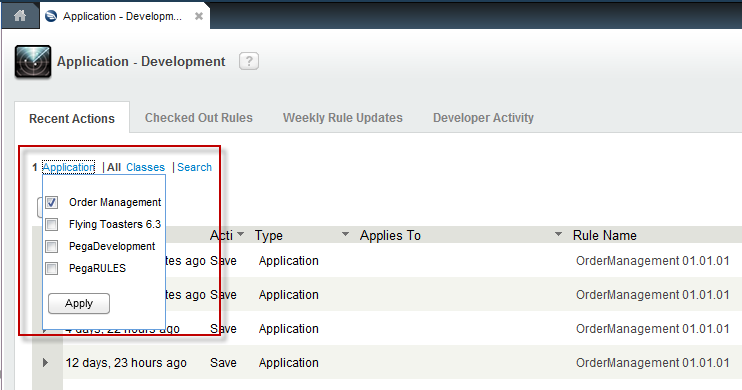 This allows applications to take advantage of the many ways to populate a page. The Conditions tab of the When form is redesigned to present individual conditions in an interactive tree format. For those conditions that are described completely on that tab, the new format is easier to understand and use. All existing When conditions are automatically converted to this format. The when condition rule accepts parameters. When multiple work items are open in the current portal (such as the Designer Studio or Case Manager portal), each corresponds to a distinct, dedicated Thread. The Threads menu in the Clipboard tool now identifies the work type and work ID that corresponds to each Thread. When editing a flow in Discovery Map form, you can define Page and Page List properties, as well as Single Value properties complete with auto-generated UI. This allows you to build a more complete data model supporting your application while still using the Discovery Map. From the Diagram tab of the Flow form, when using Process Modeler, you can access reports that present statistics about use of each shape in the diagram. The Task Volumes, Flow Analysis, and Task Duration reports, known as Overlay reports, were available only for Visio flows in 6.2 SP2. Similarly, the Policy Override feature is now available for Process Modeler flows. See How to display process statistics using flow overlays in Process Modeler. Shape and connector interactions, along with Save time, are many times faster. The interaction with swim lanes is improved. See How to use swimlanes in Process Modeler flows.